Helping investors make good real estate decisions. Ashworth Partners is a member of Amazon Associates, an affiliate program that allows websites to earn commissions by linking to Amazon. When you purchase a book on Amazon from one of our links we earn a small commission, generally less than fifty cents. This helps offset the expenses of maintaining the site but doesn’t cost you anything extra. However small the commission we appreciate your support very much, thank you. FHFA’s DeMarco re-affirms cutting Fannie and Freddie apartment building loan volume. While 10 percent doesn’t sound like much, Fannie Mae and Freddie Mac combined to finance about $62.8 billion in multifamily deals last year, meaning about $6 billion in liquidity will Continue reading FHFA’s DeMarco re-affirms cutting Fannie and Freddie apartment building loan volume. Posted on March 25, 2013 June 3, 2014 Categories Apartment Finance, Multifamily Investments, The Economy and Current AffairsTags Apartment Building Investing, apartment loans, banks, CMBS, Edward DeMarco, Fannie Mae, Federal Housing Finance Agency, FHFA, FHLMC, FNMA, Freddie Mac, GSE, insurance companies, interest rates, lending, multi family investments, trends, underwriting3 Comments on FHFA’s DeMarco re-affirms cutting Fannie and Freddie apartment building loan volume. 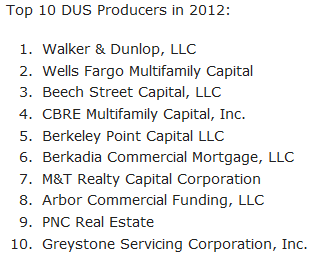 Fannie, Freddie list top Apartment Building lenders for 2012. Southeast Region: Berkadia Commercial Mortgage, Richmond, Va.
Western Region: CBRE Capital Markets, Newport Beach, Calif.
Northeast Region: Beech Street Capital, LLC, New York, N.Y.
Fannie grew their small loan volume by Continue reading Fannie, Freddie list top Apartment Building lenders for 2012. Posted on February 5, 2013 March 11, 2013 Categories Apartment Finance, Commercial Real Estate, Multifamily Investments, The Economy and Current AffairsTags affordable housing, Apartment Building Investing, apartment loans, Fannie Mae, Federal Home Loan Mortgage Corporation, Federal National Mortgage Association, FHLMC, FNMA, Freddie Mac, lenders, MHN, multifamily lending, Multihousing News, small apartment loans3 Comments on Fannie, Freddie list top Apartment Building lenders for 2012. MBA: GSEs vital in Ensuring Liquidity and Stability in apartment building investment finance. 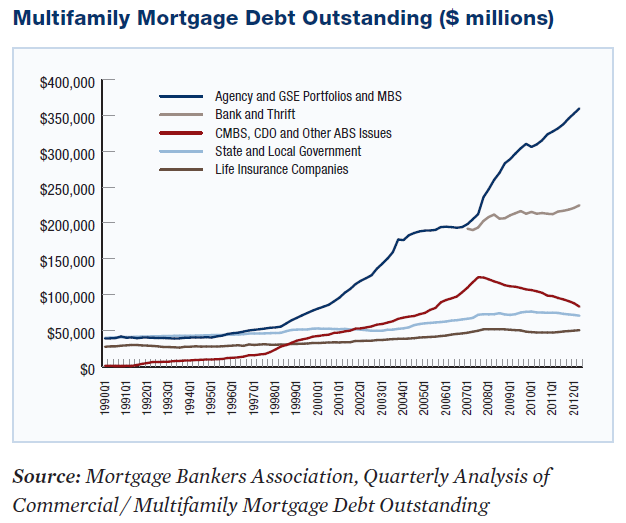 The Mortgage Bankers Association is out today with a white paper “Ensuring Liquidity And Stability: The Future Of Multifamily Housing Finance And The Government-Sponsored Enterprises“. (or see the MHN exec sum here) The paper highlights the role of the GSEs (Government Sponsored Enterprises, i.e. 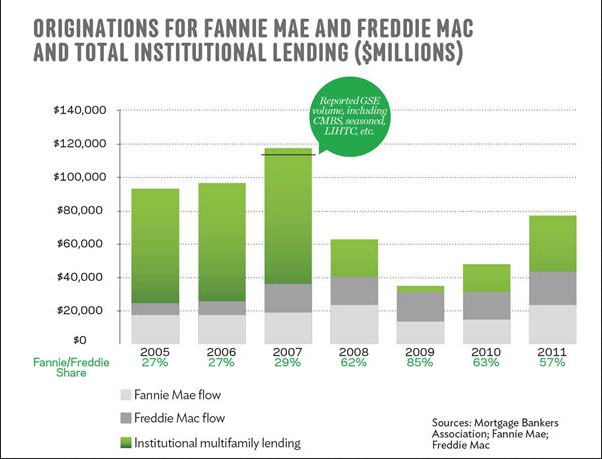 FNMA ‘Fannie Mae’ and FHLMC ‘Freddie Mac’) in today’s multifamily finance market and presents five recommendations for the future making their points with a set of charts that demonstrate the size of their role in multifamily as well as the very low amount of bad loans they’ve made in the sector. 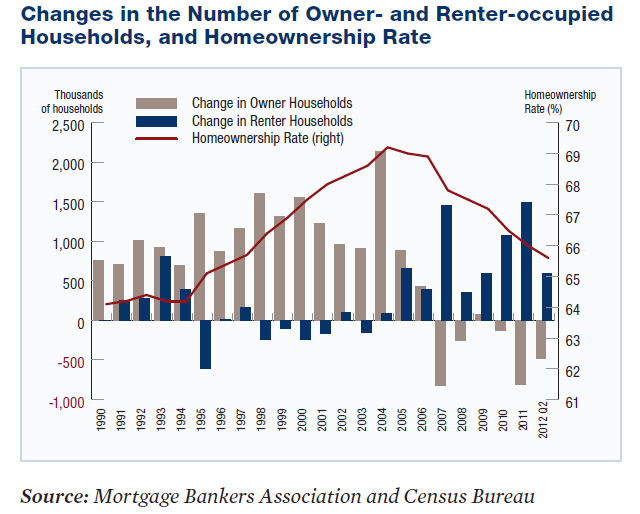 Our nation’s housing policies should reflect the importance of multifamily rental housing, the range of capital sources that support this market, and the need for liquidity and stability in all market cycles. Continue reading MBA: GSEs vital in Ensuring Liquidity and Stability in apartment building investment finance. Posted on December 14, 2012 December 14, 2012 Categories Apartment Building Investment Cycle, Apartment Finance, Multifamily Investments, The Economy and Current AffairsTags Apartment Building Investing, apartment building investment cycle, apartment demand, banks, CMBS, Fannie Mae, Freddie Mac, GSE, HUD, insurance companies, MBA, Mortgage Bankers Association, multi family investments, renter households, trendsLeave a comment on MBA: GSEs vital in Ensuring Liquidity and Stability in apartment building investment finance. An interesting piece from Bloomberg entitled: Private Equity Has Too Much Money to Spend on Homes talking about how hard it is for large funds to buy foreclosed homes in bulk and turn them into rentals reminded me of a conversation I had with one of my private equity clients who was consulted by Tom Barrack’s Colony Capital about doing just that (and he said don’t).